Friend of Gamaliel II. (first and second centuries). 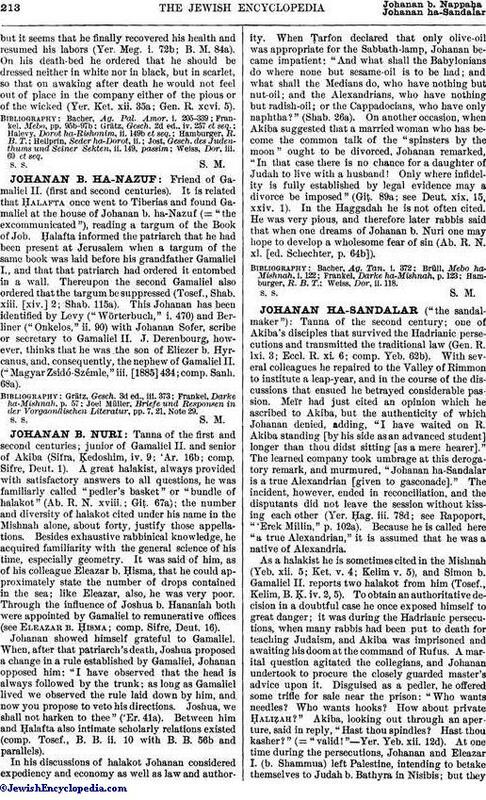 It is related that Ḥalafta once went to Tiberias and found Gamaliel at the house of Johanan b. ha-Nazuf (= "the excommunicated"), reading a targum of the Book of Job. Ḥalafta informed the patriarch that he had been present at Jerusalem when a targum of the same book was laid before his grandfather Gamaliel I., and that that patriarch had ordered it entombed in a wall. Thereupon the second Gamaliel also ordered that the targum be suppressed (Tosef., Shab. xiii. [xiv.] 2; Shab. 115a). This Johanan has been identified by Levy ("Wörterbuch," i. 470) and Berliner ("Onkelos," ii. 90) with Johanan Sofer, scribe or secretary to Gamaliel II. J. Derenbourg, however, thinks that he was the son of Eliezer b. Hyrcanus, and, consequently, the nephew of Gamaliel II. ("Magyar Zsidó-Szémle," iii. 434; comp. Sanh. 68a). Joel Müller, Briefe und Responsen in der Vorgaonäischen Literatur, pp. 7, 21, Note 29.